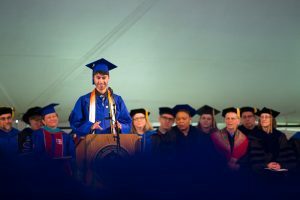 James Ramsey III, a graduate of Eastern Mennonite University’s Adult Degree Completion Program, captured the range of ages represented among the graduates at Eastern Mennonite University’s Commencement ceremony on Sunday, reminding all present that the empowerment of education spans a lifetime. “Today, we celebrate whether we are 22, 42 or 62,” he said. 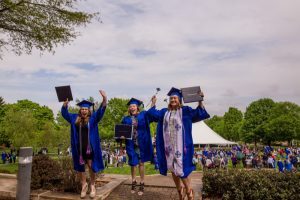 View Commencement video and photos. 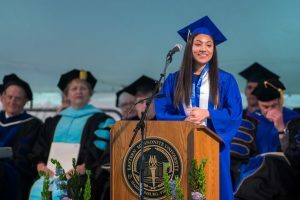 From the traditional undergraduate to the students that Ramsey characterized as “paper-writing weekend warriors” juggling family and work obligations, the three-hour ceremony under the massive white tent on EMU’s front lawn symbolized both an end and a beginning. “It’s been a long journey,” said one Master of Science in Nursing graduate who arrived early, her apricot-lined silken hood folded neatly on her lap as she waited patiently in Lehman Auditorium for the processional to begin. 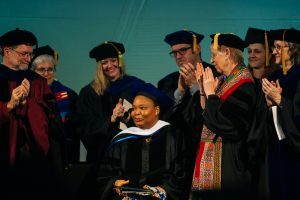 On the occasion of its 100th Commencement, the university conferred 386 undergraduate degrees and 154 graduate degrees, including its first honorary doctorate to alumna and Nobel Laureate Leymah Gbowee MA ’07. “In one hundred years of EMU’s existence, who would have told anyone that a girl from West Africa, a tiny village, a tiny country, who came here to validate and to justify her inclusion in peacebuilding work at the community level would come back several years later as the first honorary degree-awardee?” Gbowee asked. Read the 2018 Commencement address. Sarah Bailey, who earned a Master’s of Divinity from Eastern Mennonite Seminary. 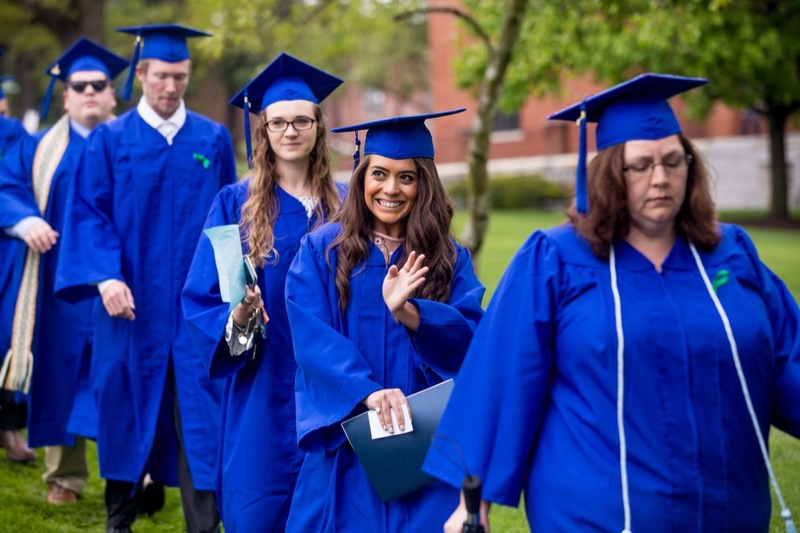 Her two years at EMU, filled with “intimate, important conversations” with counseling professors and others,” have helped her to learn more about who she is. Staff writer Christopher Clymer Kurtz contributed to this article.